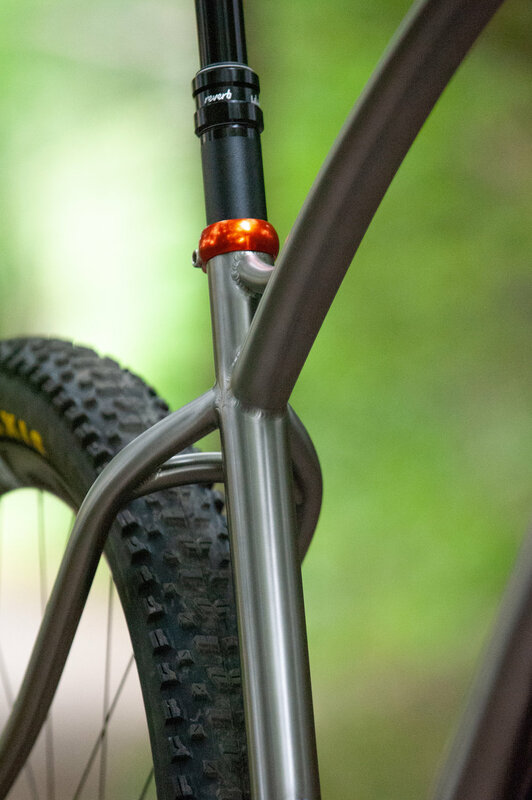 Kipp's Titanium 29er for 2.6" Tires — Sklar | Handmade Bicycle Frames. Mountain, Cyclocross bikes built to order. First it was 2.2's then 2.4's then 3.0's then 2.8's but now the future is here and it is 2.6" wide! I've been having this conversation with customers a lot. The plus tire craze took the hardtail world by storm and those massive 3" treads are really fun. We found out that low PSI is amazing and traction is good. But also we found out that heavy tires do make a difference and that much rubber leads to vulnerable sidewalls. Those reasons are why I for one am really psyched to see more 2.6" tires out in the world. This size offers just enough of that high volume to run a very pleasant tire pressure but still maintain a reasonable weight and durability of a tire. Expect to see 2.6" tires on all of my mountain bikes for the foreseeable future and if you are ordering a MTB from me, expect me to talk you into a set as well. Anyhow, this post is more about Kipp's new ride. 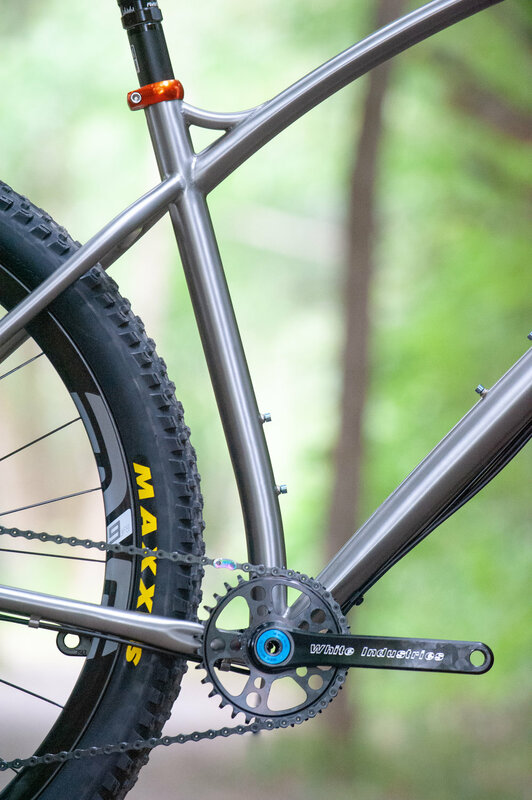 A sweet Titanium hardtail designed around 29x2.6" tires, a 140mm travel fork and 12 speed drivetrain. Kipp is tall and so this frame is pretty large. He plans on riding everything from rough singletrack to smoother jeep roads and the occasional gravel path. We went with a more "all day XC" fit for comfort and handling, and hung some parts on the frame that should last Kipp a really, really long time. Anyhow, if I were to have just one bike, it would look a lot like this, albeit a little smaller. Can't wait for Kipp to get it out on the dirt!